The new TV seasons are starting and I'm super excited! There are very few shows I watch and don't let record for a later time. 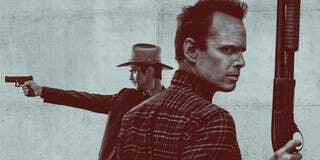 Justified is one of those. It's one of my favorite shows ever. Mostly because of the dynamic between those two men up there, Timothy Olyphant and Walton Goggins (Rayland and Boyd). Even when they aren't in the same scene, which is becoming more common, they are brilliant. I can't recommend this show enough. Then there is my other favorite FX show, Archer! So much awesome in one picture! Winter is coming...In April. Is it April? So what shows are you looking forward to this season?